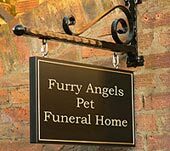 If you are looking for a pet funeral home in your area, this directory will help you to locate one. Help keep us informed and up to date. If you know of any new pet funeral homes or would like for us to update existing information, please use this form. Harthaven Pet Cremation and Burial Service Inc.
10953 North Frank Lloyd Wright Blvd. 624 N French Funeral Home. Main St.
Pets at Peace by Harris Funeral Home.